Our interdisciplinary performances and installations stretch the space of the ‘in-between’: between mind and body, nature and technology, the awake and subconscious, risk and responsibility. We work with the moving body, sound, images, light, and real-time generated data to explore that in-between space. Not as parts of a solid narrative, but as ingredients of a living ecology. Mathematician Verhoeff and choreographer Van Berkel present a lecture performance on the ‘spurs’ of Lehmer. In mathematic visualisations these ‘spurs’ appear on paths in permutation graphs. For this lecture performance the permutation graphs and the spurs are translated into movement, image and sound. The characteristics ‘proximity’ and ‘minimal change’ form the basic ingredients for an exact and playful combination of science and art. NOW presents a new work: “BLINK …and sync” at Come Together # 4 2019 . BLINK is a performance using eye blinking as a performative tool. It is a part of our research into rhythms and patterns of our body and brain, and conscious and unconscious blinking as indicators of states of mind and different moods. We will perform an experimental score for three people that generates blink instructions with different rhythms and chance variations. The blinks are captured with EEG and translated into a musical piece for light and sound, using the body as the intermediate between two different systems: the score and the performance environment. SEE ME NOW is een live performance in de voormalige koepelgevangenis in Haarlem waarbij het publiek de architectuur en de geschiedenis van het gebouw op een bijzondere manier kan ervaren. Met licht en geluid openen Tränkle en Bol de ruimte en de geschiedenis van de bewoners voor ons. 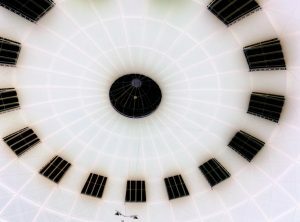 De koepelgevangenis is gebaseerd op het idee van het Panopticon, bedacht in de 18e eeuw door Jeremy Bentham, als een architectuur voor een perfecte controle. “A cruel, ingenious cage” volgens de filosoof Foucault. Tränkle en Bol benaderen deze architectuur in een compositie die speciaal gemaakt is met het gebouw. De tegenstellingen en de relaties van het centrum met alle 224 individuele cellen worden verbeeldt en op een nieuwe manier geïnterpreteerd door geluid, licht en beweging. Er ontstaan ritmes, synchroniciteit, relaties en black-outs: continu veranderende patronen gemaakt door mensen en hun geschiedenis met het gebouw. Iedereen is vrij om het gebouw opnieuw te ontdekken, er is geen vaste plek voor het publiek. Door je te verplaatsen door de koepel verandert de emotionele en ruimtelijke beleving en transformeert de koepel zich door onze eigen oren en ogen. Can we detect our unique characteristics as individuals, and project this into the outside world? (un)focussed is a live brain choreography, in which we use sensors (the Muse headband) to compare the brain-states of two performers. This performance was originally commissioned by the Amsterdam Brain and Mind project / VU University in Amsterdam. We compare the brains of our two performers Roos and Tashi, by streaming the data of both EEG’s live and sending it to two lasers. The different brainwaves are bend in a circular shape, allowing to depict restlessness with a more noisy spectrum. The data also influences the sound environment. The performers have physical and mental tasks, we combine the brainwave data with the accelerometer and gyroscope of the EEG to make the performance more dynamic and use their physical presence as well as their mental state. Halfway into the performance we use 10hz flickering to manipulate and sync their brainwaves, similar to the effect of the dream machine. At the end Roos and Tashi can direct the laser bundle by concentrating and point it to a light sensor. The sensor triggers big blinding lights, and with a pure mental task they can blind the audience and influence the space. The Performing Arts Fund NL, the Creative Industries Fund NL, the Amsterdam Brain and Mind project and the Amsterdam Neuroscience Alliance. Special thanks to Patricia Pisters, Arjen Brussaard and Wijnand Geraerts. Composing involves listening to the world around you. To the hum of the fridge or the noise of the record just before the song starts. When performing I use my body to manipulate these sounds with light sensors, touch, gesture or brainwaves. I am part of composers group Monoták. My work is often interdisciplinary, working internationally with dancers, choreographers, light designers and filmmakers. Besides being a composer, performer and curator I work in the area of music and mental health. I studied history in Groningen and Sonology in Den Haag. I am a dancer and choreographer based in Amsterdam. I work on the intersection of dance and technology. The core of my work lies in systematically observing and choreographing movement for the human and non-human body, while questioning relationships that revolve around similarity and difference. I have shown my work at various digital art and art & technology festivals in The Netherlands: E-Pulse, STRP and Discovery festival. Other festivals include Gent Light Festival, Museumnacht A’dam and different theatres in Hungary and Romania. For the past ten years I have been teaching at the Academy for Theatre and Dance and Eindhoven University of Technology. In July 2018 I received a development grant from the Amsterdam Fund for the Arts (AFK) to create compositional scores for dance and technology based on scientific themes. I like observing patterns. As a trained architect as well as software engineer, I am skilled to be analytical about structures and systems. I like to take a birds-eye view on stuff, to see how things, ideas, and people are entangled and how they act together. I started my career in the political and social climate of Berlin after the fall of the wall, working in architectural design for communal housing projects. After my move to the Netherlands some 20 years ago, I engaged with the unstable quality of dynamic relations and temporal spatial structures. I studied choreography and worked as lighting designer for build environments. Today, I work in performance art integrating system thinking, computational processes and live-performance into stage scenarios. I have a preference for cross-discipline perspectives, research and experimentation. Currently I also teach at the Eindhoven University of Technology and at the ArtScience Interfaculty at the KABK in den Haag.